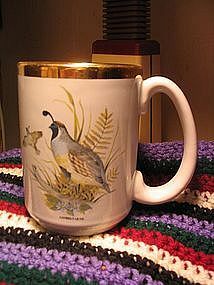 Vintage mug with a Gambel's Quail picture. It is approximately 4 1/2 inches in height. The bottom is embossed as Made in England, and it is possible that it was made by Churchill China. It is a very good quality porcelain. There are no chips, cracks, breaks or rough rims, but has some loss to the gold trim. I need your zip code to calculate the postage.